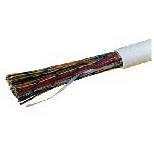 A range of copper telephone cable including cw1308, cw1128 and cw1109 used for voice cabling installation. Our voice cables come in a choice of length. We supply 4, 10, 25, 50 and 100 pair telephony cable in up to 500 metre lengths.